A Devon couple who live in a Mongolian-style yurt have won their appeal to stay in their hut home. Marcus Tribe and Sarah Harvey have lived largely self-sustained on a seven-acre site at Nomansland, near Tiverton, for the past six years. 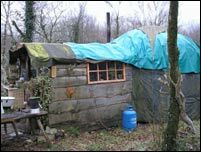 Mid Devon District Council ordered them to demolish the hut last December. But an inspector has granted them permission to stay as long as they do not extend it, and ensure it is removed if they leave.